Recess by Narciso Desmadryl from Perkins Bacon Plates 1854 (Jan-Feb): 5 c. deep reddish-brown, a fine used pair with close to large margins on all sides, portions of adjoining stamps at top and at base, showing the Major Plate Crack running across both stamps (positions 121-122) with the Crack going through 'C' of CORREOS, first and second 'O' of COLON and repeated through into right hand stamp (see illustration on page 50 of EDITION D'OR volume XXVI); used on 1857 cover from Serena to Valparaiso and tied by target handstamps in black. SERENA cds of despatch in black at right (Sept 12). Fascinating notation in crayon reverse stating purchased in New York in 1934 from C. J. Phillips, philatelic writer, expert and the former Chairman of Stanley Gibbons. 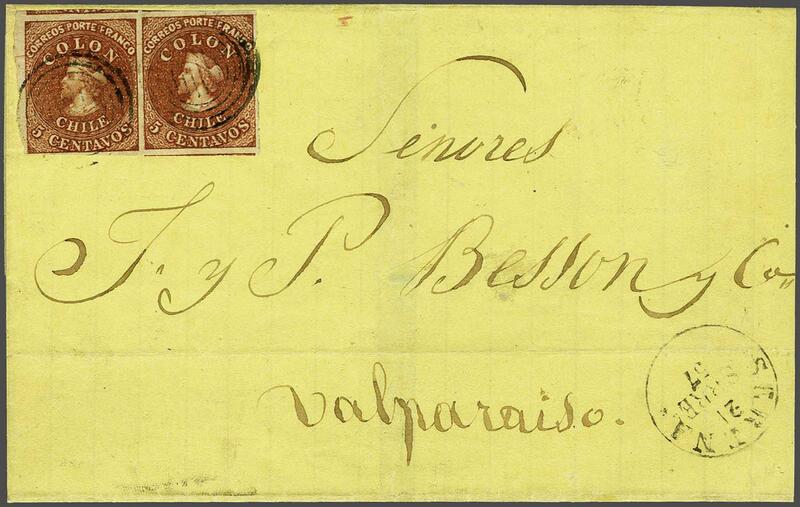 An outstanding cover for the specialist.rnProvenance: Collection Joaquin Galvez, Corinphila sale 62, May 1979, lot 3168; Collection Gerhard Blank, RL, Dec 1991, lot 985.